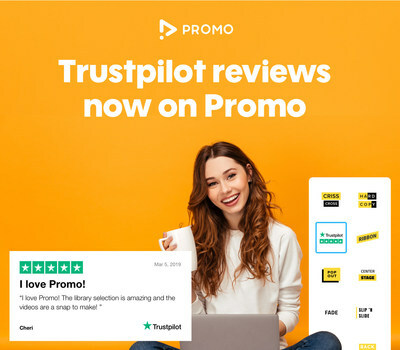 TEL AVIV, Israel, April 17, 2019 /PRNewswire/ -- Promo.com, a world leading video creation platform, today announced a partnership with Trustpilot, a leading global customer review platform, to help businesses integrate customer reviews into their marketing videos for added credibility, engagement, and performance. Review-based videos are proven to be more powerful and effective as people look for trust and social recommendations regularly on social media. With this partnership, anyone can use Promo to incorporate highly engaging review content into their marketing videos at the click of a button. The integration, which will utilize Trustpilot's API to import authentic customer feedback, enhances messaging and credibility, offering improved brand awareness, customer loyalty, and retention. Promo.com users can now sync to their Trustpilot accounts to access their best recent reviews as well as their Trustpilot TrustScore to showcase in their video ads. This short and simple action lets digital marketers achieve beautifully designed results. "Video has quickly become one of the most powerful tools in a marketer's toolbox," said Peter Simpson, Global Head of Partnerships at Trustpilot. "It continues to outperform text and images for engagement, and when combined with social proof in the form of authentic customer feedback its potency is exponentially greater. Partnering with Promo.com was a natural fit given its streamlined, user-centric platform and the incredible value delivered to our joint users." According to Pew Research, more than half of all adults now utilize online reviews to inform their purchasing decisions, and studies from the Spiegel Research Center conclude nearly 95 percent of shoppers read online reviews before making a purchase. In addition, 84 percent of people trust reviews they read online as much as personal recommendations, according to Bright Local. "Adding customer reviews into Promo videos is a great way to boost sales, add credibility, and achieve better marketing results. It builds 'social proof' and leverages the power of your existing customers to attract new ones while increasing customer loyalty," says Tom More, Promo.com CEO. "We are very excited to partner with Trustpilot, an industry leader that shares our customer centric approach. Promo.com will continue to add more value to our customers and the video space through new innovative partnerships that will help our users grow their business." Consumers post more than 2 million reviews on Trustpilot every month. Beyond the star ratings, Trustpilot customers can access deep insights and analytics from the review content that business can leverage to improve products, services, and to connect with their audiences at scale. Promo.com is already being used by over one million businesses of all sizes, from solopreneurs, and freelancers, to Fortune 500 and publicly traded companies in over 200 countries. For more information, visit Promo.com and Trustpilot.com. Trustpilot is a leading independent review platform, free and open to all companies and consumers. With more than 60 million reviews of over 275,000 domains, Trustpilot gives people a place to share and discover reviews of companies, and enables every company to turn consumer feedback into business results. Trustpilot's mission is to bring people and companies closer together to create ever-improving experiences for everyone. Its brand is seen more than 3.5 billion times online each month. With offices in Copenhagen, London, New York, Denver, Berlin, Melbourne and Vilnius, Trustpilot's 700 employees represent more than 40 different nationalities. For more information, visit https://www.trustpilot.com/. Promo.com is the #1 video creation platform for businesses and agencies. Promo.com helps businesses of all sizes to leverage great visual content to promote anything they want online in smart, effective ways. Promo.com offers access to over 15 million premium video clips and images, ready-made templates, pre-edited licensed music, and a user-friendly editor. Promo.com is an official Facebook & Instagram Marketing Partner, and a Youtube Creative Partner. Promo.com is a privately held company with offices in Tel Aviv, NYC, and Warsaw. For more information, visitPromo.com and follow Promo on Twitter and on Facebook.